cat. no. 114, p. 254 (illustrated in colour). With its powerful black and whites, the present Untitledis emblematic of Franz Kline’s most iconic works and technique, based on that “action painting” which came to define Abstract Expressionism. For few other 20thcentury artists do works on paper held such a primal role in their oeuvre. The late 1940s and early 1950s marked an important transitional period in Franz Kline’s career. His first solo exhibition at the Egan gallery in New York in 1951 had inaugurated him as an abstract artist. The present work is a fine example coming out of this crucial and dramatic period in Kline’s career. 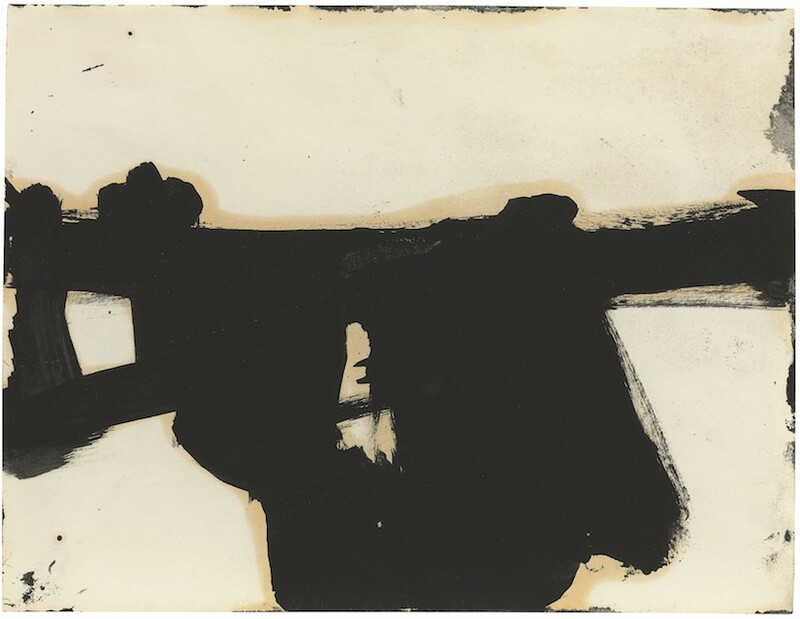 A rare and important piece, it was the only Kline work on paper exhibited at the 2016 Royal Academy, London Abstract Expressionism and 2017 Guggenheim Bilbao exhibitions. The dynamic wielding together of white and black in a gestural abstract composition suggests a transition to the language of abstract expressionism. While Kline was a late-bloomer where abstract expressionism is concerned, arriving at his abstract style after Willem de Kooning and Jackson Pollock, his black and white works represented a unique current in the abstract expressionist circle. The 1951 show at the Egan gallery caused a stir: after his inaugural show he was dubbed the ‘black and white artist’, showing the importance of this period not only for his career at the time, but also for his legacy. A close friendship with de Kooning, one of the foremost abstract expressionists, and, like Kline, a ‘downtown artist’ is perhaps the most important force in Kline’s transition to abstraction. According to Elaine de Kooning, he had aided the evolution of Kline’s large-scale abstractions when Kline enlarged a small black and white drawing using a Bell-Opticon projector. “Both he and de Kooning were astonished at the change of scale and dimension when they saw the paintings magnified…against the wall…From that day, Franz Kline’s style of painting changed completely.” Later in the 1950s it would be Willem de Kooning borrowing from Kline’s black-and-white format, in particular to enhance the graphic quality in his black-and-white Rome paintings cycle. The black and white tendency, to which Kline arrived as a mature and seasoned artist, may relate to the psychological effect of the loss of his father to suicide when he was just seven years old. Indeed, such traumatic childhood memories would have also conjured up the very atmosphere of the town in which Kline was born and where he spent his childhood: Wilkes-Barre, a coal-mining community in Eastern Pennsylvania. Ours is a fine example that visualises the very creative process of his black and white period. When Richard Diebenkorn visited Kline’s studio in the 50s, he was surprised at the way Kline produced the black and white paintings. The large and imposing works that had made Kline famous came directly from smaller studies, which Kline enlarged while remaining faithful to the original compositions. The issue of scale, so important for the often monumental compositions of abstract expressionists was approached differently by Kline: he remarked that “no matter how small a drawing you do, if it’s interesting it has a quality of largeness.” As a result, the oil studies figure as a crucial component of the progress towards his larger compositions. In the post-war period the centre of modern art shifted from Paris to New York, and New York’s new status was announced by the modernist movement of its own – Abstract Expressionism. As a movement it is significant for the way its approach to abstraction calls one to reflect on the very process inherent in painting. If in Jackson Pollock’s paintings the emphasis is maintained on gesturality and the artist’s physical involvement in the creation of the work, then with Kline the crucial process is analytical. The way in which his detailed knowledge of European modernist and old master painting informed his abstraction can metaphorically represent the bridging of the gap between the two shores of the Atlantic at a time when artistic centres were shifting dramatically. His is an abstract expressionism that is unimaginable without the analysis of Cézanne, the advancement of Cubism by Braque and Picasso, the dynamism of black-and-white photography at the Bauhaus. An intricate knowledge of modern painting’s history, like that of Kline, was a prerequisite for the emergence of a movement not only theoretically rigorous, but also infused with the charm of art and artists past, a memory of modernism’s previous chapter. Yet Kline’s abstract compositions seem also to emerge out of a romantic fascination with the urban environment of New York, with many noting the similarities between the stark black-and-white contrasts and the modern, streamlined architecture of New York’s bridges and skyscrapers, as photographed by contemporary photographers. The influence of New York City as the driving force in Kline’s work can be traced through the titles: Ninth Street, the bridge, Third Avenue. A recent critic wittily drives the context home: “As a native New Yorker…two colours are worthy of art – black and white; all other colours are appropriate for illustrations.” (Richard Kostelanetz, Dictionary of the Avant-Gardes, 1993). As Abstract Expressionism expert and famous art historian David Anfam suggests, “Kline’s vocabulary repeatedly manages to cross between the abstract and the half-recognisable.” Indeed, for Kline certain forms could develop into a figurative image. His works actually often appear to evoke the hard quality of steel girders, while maintaining their spiritual and emotional quality of black and white moods. The unique and evocative pictorial language of abstract expressionism, then, did not restrict the works to pure abstraction. It was another way of seeing the urban environment, and a way to infuse it with a newly found romanticism and a kinetic quality so characteristic of New York.